What is the Magic Planet? The Magic Planet® is a digital video globe – a digital projection display with a sphere-shaped screen. It allows you to view and explore dynamic digital media that helps to explain our world. It’s proven to significantly increase comprehension, as well as participation and collaboration in K-12 classrooms. How does the Magic Planet work? 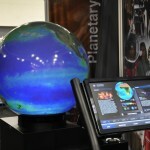 The Magic Planet is a “rear projection display device” with a sphere-shaped screen. A digital projector shines an image through our patented lens which distributes light evenly and in focus around the spherical screen. The spherical screen has a unique coating on the inside so that the image you see is equally bright around the globe, no matter your viewing direction (unlike most rear projection screens, which get dark as you move to the side). The image projected on the Magic Planet is typically generated by a computer, connected to the Magic Planet by a standard video cable. What configurations and sizes of the Magic Planet are there? The K-12 Magic Planet product line comes in two configurations: portable and pedestal. The portable comes with a choice of two globe sizes: 16″ (41cm) or 24” (61cm). The pedestal configuration comes in a choice of three sizes: 24” (61cm), 30” (76cm), and 36”. For other configurations and sizes, please visit the exhibits section of our site, where we offer globes in 13 different diameters up to 3m, and in configurations with one, two or four projectors. What type of projectors are used? How often do the bulbs in the projector need to be replaced? The Magic Planet portable never needs a bulb change – it’s a hybrid LED projector. As a result, its operating costs are minimal. The pedestal projector’s bulb life is 3,000 hours – about 4 years of use at 4 hours per day – and new bulbs cost about $400. What is the globe made of? The globe is made of durable acrylic with a special coating on the inside that allows the images to be projected clearly. The globe comes standard with anti-glare coating. It can be washed with soap and water. Can I move the Magic Planet between classrooms and between schools in the district? It’s easy to move both the Magic Plane portable and pedestal between classrooms. The portable is lightweight, and is usually either put on a cart or simply carried. The Magic Planet pedestal comes with wheels, so it’s easy to roll between classrooms. The portable has optional cases (one for the globe, and another for everything else) so it’s easy to pack and put in a small car for transport. If it’s in its cases, it takes about 7-10 minutes to set up and start using it. Cases for the pedestal system are available, but are special order. Where do the images, animations and movies for the Magic Planet come from? Can I make my own? We’ve collected a huge library of content for the Magic Planet – and there’s even more available on the Internet with simple image searching. Global Imagination® has hundreds of institutional customers that provide informal education, like NASA, NOAA, the European Space Agency, the Smithsonian, as well as various universities like the University of Sydney, University of Texas at Austin, and many others. When they create content, they typically make it freely available to for educational use – so K-12 schools may use it at no cost. In addition, our software uses the Internet standard for global imagery, so new content for the Magic Planet is a just an image search away. There’s also plenty of software to create your own images and animations, from tools for non-technical users all the way up to tools for professionals, such as After Effects and ArcGIS. In addition, various apps for the Magic Planet come with their own content. For example, Eyes on the Earth from the Elumenati and JPL includes feeds of global data and satellite locations. Starry Night from Simulation Curriculum includes a full solar system tour. And Dynamic Earth, from Global Imagination provides real-time weather and earthquake feeds. How do I incorporate the Magic Planet into my lesson? Connecting a PowerPoint lesson to the Magic Planet is point-and-click: show the slide in PowerPoint; show the image, animation or movie you want on the Magic Planet, then click on our PowerPoint toolbar and they’re connected – the next time you show the slide in presentation mode, our software will automatically display the chosen image on the Magic Planet. The Magic Planet also works with Interactive Whiteboard (IWB) software, and it can be controlled from an iPad or tablet. So incorporating the Magic Planet into your lesson is easy. How do I interact with the Magic Planet? You can interact with the Magic Planet a number of ways. The simplest is just to go through your lesson, and let the Magic Planet automatically update what’s displayed to match your slides and help explain your material. There’s a simple app to let you control the Magic Planet from your interactive whiteboard with your finger – to spin what’s on the Magic Planet, pause and play animations, etc. There’s an iPad app to select what’s displayed and to provide simple control. There’s an RF remote, so you can walk around the class and show what you want. And there are a variety of 3rd party products that have drivers for the Magic Planet, such as the wireless SpaceMouse from 3DConnexion. What platforms does the software run on? The platform for the software depends upon the apps you’re using. For example, the Basic Software Package that comes with the Magic Planet runs on a PC, but can be controlled using an iPad app. Or, you can use any of Simulation Curriculum’s software and lessons for the Magic Planet on either a Mac or a PC – they can also be controlled via iPad.